Molecular chaperones have several critical functions in protein metabolism. Among them, some are involved in processes that culminate in the extraction of entangled polypeptides from protein aggregates, releasing unfolded structures prone to be refolded or directed to degradation. This action avoids the effect of toxic aggregates on cells and tissues. 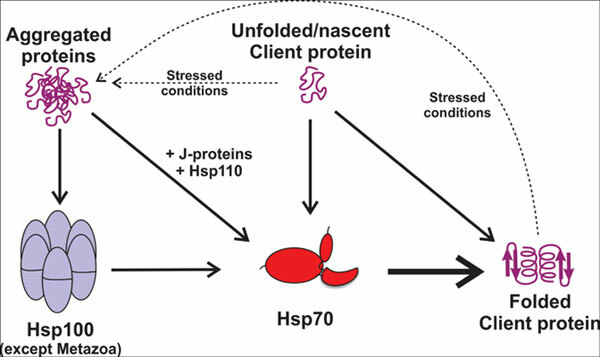 Molecular chaperones belonging to the Hsp100 family are widely distributed from unicellular and sessile organisms up to fungi and plants, exerting key functions related to the reduction of the effects caused by different forms of stress. The Hsp100 proteins belong to the AAA+ (ATPases Associated with diverse cellular Activities) family and form multichaperone systems with Hsp70 and small Hsp chaperones families. However, Hsp100 are absent in metazoan, where protein disaggregation action is performed by a system involving the Hsp70 family, including Hsp110 and J-protein co-chaperones. Here, the structural and functional aspects of these protein disaggregation systems will be reviewed and discussed in the perspective of the Hsp100 system absent in the metazoan kingdom. This feature focuses on Hsp100 as a hot spot for drug discovery against human infectious diseases such as leishmaniasis and malaria, as Hsp100 is critical for microorganisms. The current data available for Hsp100 in Leishmania spp. and Plasmodium spp. are also reviewed. Hsp100, Hsp110, Hsp70, J-proteins, protein aggregation, protein disaggregation.